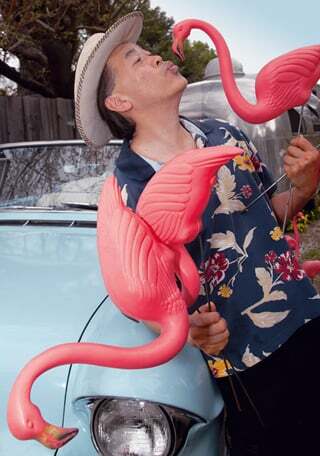 Free spirit Phil Toy, who lives in a Walnut Creek Eichler, gives one of his own flamingos a smooch while leaning back on his 1957 powder-blue Cadillac. The Hillsborough Concours d’Elegance was approaching and Phil Toy, photographer, artist, and connoisseur of life, was ready. And so was the powder-blue baby he planned to display—his 1957 convertible Cadillac de Ville. It was a gorgeous car with voluptuous curves, chrome speed lines, and two pert little fins in the back. But something else was needed, something to draw all eyes his way. Today, the winning car, along with Toy’s several other 1950s Cadillacs, share space at his home in the Walnut Creek Eichler neighborhood of Rancho San Miguel. Some people may love them, and some people may hate them, but it’s hard to argue that the pink flamingo has become an American icon. Invented in 1957 by a young, recently minted fine arts sculptor, Don Featherstone, who should have known better, the birds quickly took over lawns throughout the United States, beautifying some, defiling others, captivating some observers with their beauty while sending others into paroxysms. Pink flamingos have divided Champagne connoisseurs from beer-swilling bowlers, opera lovers from fans of honky-tonk, even husbands from wives. Twenty-one years after revealing the Bernell flamingo spat the New York Times, still on the story, found itself in the snooty town of Clifton, New Jersey, where new homeowners Kevin Lee Allen and wife found their lawn ‘flocked’ with 24 pink flamingos, plunked there by their friends as a welcoming touch. Flocking? You don’t know flocking? For decades now, friends, occasionally enemies, groups doing it to raise funds for breast cancer research and other charities, even business people who make their living this way have been filling homeowners’ lawns surreptitiously and late at night with dozens, if not hundreds, of pink winged creatures. The Allens loved their flock. Not so the neighbors. 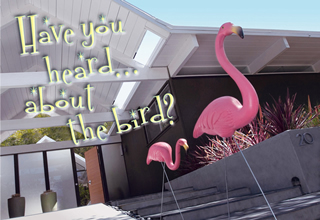 They even draw the line against pink flamingos at Pomeroy West, a very non-snooty Santa Clara complex developed by Joe Eichler, whose rules forbid exterior changes to units except for relatively minor matters like doorway color and hardware. “If they put in a pink flamingo mailbox, they would hear about it,” Scott Jaskower, a homeowner association president, said a few years back. Cultural critic and flamingo collector Jennifer Price, who’s clearly given more thought to the hermeneutics of pink flamingo-ism than anyone alive (the essay in her book Flight Maps: Adventures with Nature in Modern America is a blast), nails it. It’s a form of class warfare, and of people who have reached a certain level of prosperity in America and taste not wanting to be dragged back—by a bunch of silly birds.